steel, plywood, amplifier, cables, speakers, music / 96"x32"x30"
Featuring music by Al Pagano. CrotchRock has its origins in our relationship to music and sound as physical phenomena despite their invisibility. Music has the power to move us emotionally and has equally meaningful implications in social relationships and identities. 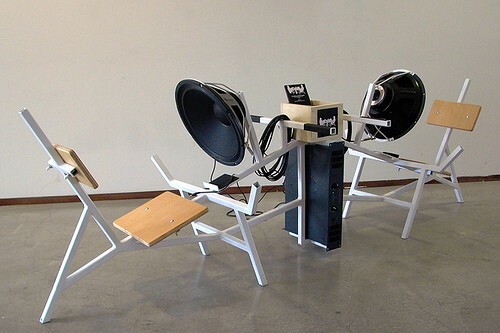 The chair draws from several sources: courting rituals using mix-tapes, CD's and playlists, the graphic sexual content of contemporary hip-hop and rock music, the tension of bodily positions and movements normally only seen in private, now seen publicly in work-out equipment and facilities. The 15-inch woofers were used to achieve maximum vibration and visual impact. They have a frequency range of 40Hz-4kHz so an album of music was composed by Al Pagano to fit within this range and to provide musical interpretations of the situation created by the chair.